Agriplus Ltd are now Tilly your Trailer Approved Testers. We are pleased to announce that we are now Tilly your Trailer Approved Testers. This new service will ensure that your trailer(s) perform reliably, efficiently and most importantly safely. 1. Check TRAILER lights are functioning correctly. 2. Check tyres have legal tread depth, no cuts, bulges, or cord/thread showing. 3. Check towing eye thickness. 5. Check drawbar & chassis for cracks. 6. Check Axle springs and U bolts including rocking beams if applicable. 7. Check all pins & bushes. 8. Check the ram seals. 9. Check all hydraulic pipes, connectors & air lines for cuts, chafing & leaks. 10. Check brake shoes and shoe springs for adjustment. 11. Check brake drums for excessive wear, grooves and thickness. 12. Check wheels studs & nuts. 13. Check there are no structural cracks or holes by raising the tipping bed if applicable. 14. Check the tailgate is secure & is not leaking. 15. Check the hand/park brake and cable. 16. Check the appropriate stand is in good working order. 17. Check wheel bearings for wear if necessary clan and re-pack. 18. Check all grease points are made serviceable. 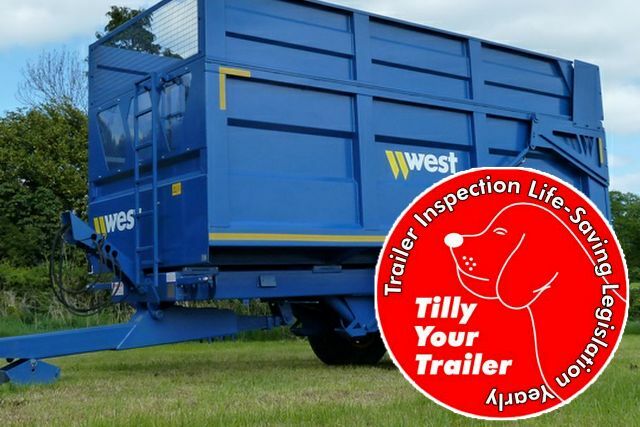 For more information about the new Tilly your Trailer Approved Testers service we offer, please contact us or visit the Tilly your Trailers website.